Willows in Little Plains River. Photo: Trevor Daly. 13% of river length was ‘severely impaired’ signifying that 50-80% of the animal species have been lost. 97% of the assessed river length was degraded; 68% moderately, and 30% substantially. More than 70% of the assessed river length was affected by changes to the physical habitat, largely due to the loss of riparian vegetation and changes to the condition of the riverbed. 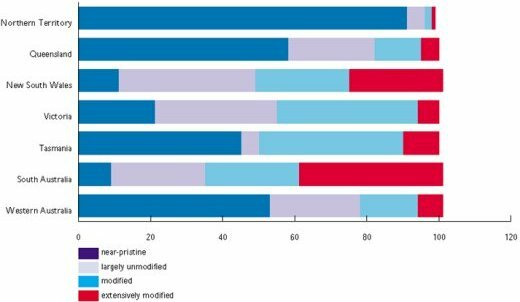 Over 84% of the assessed length had elevated loads of sediments, and 95% had elevated levels of total phosphorous. These findings highlight that freshwater habitats in NSW are under intense pressure from historic and current land and water management practices throughout their catchment. 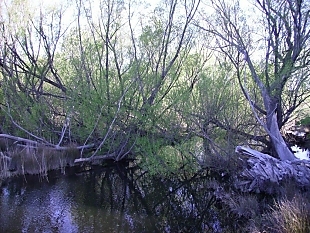 degradation of native riparian vegetation. Combinations of these factors can lead to a river being “stressed”. Even a river that does not have a large dam constructed across it or that is outside a major metropolitan area can be significantly stressed. There are 672 so-called “unregulated” rivers or river sub-catchments in NSW. Generally water extraction has the most significant impact as it affects the level, frequency and duration of low flows. Of the 672 rivers and streams identified only 461 had sufficient data available to assess their condition. Of these, 242 were found to exhibit high stress.2There are few rivers in NSW that are not regulated in some way. Weirs are widespread, with approximately 4000 weirs within the Murray Darling Basin alone. 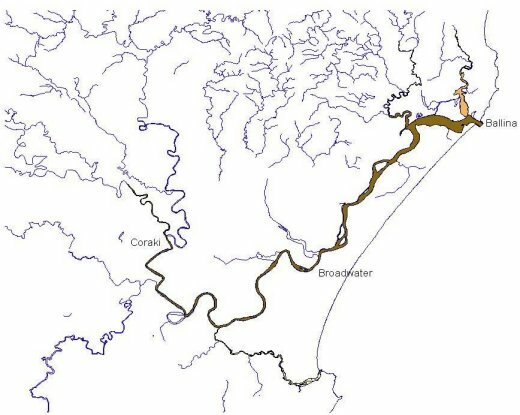 The two maps below show the natural and the altered flow regimes of the Richmond River Catchment in the Northern Rivers. 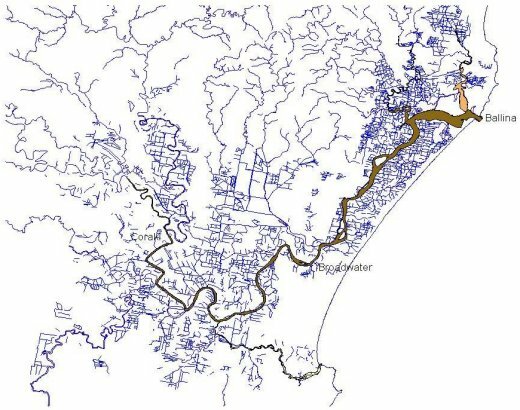 A network of drains, floodgates and levees has been constructed over the coastal floodplain to drain floodwater rapidly off the floodplain and wetlands to allow for urban and rural development. Floodgates, levees and causeways are usually barriers to fish passage. In addition, the area is subject to acid sulfate soil discharge, which, when it occurs, has a significant impact on water quality and can lead to fish kills. Estuarine habitats along the NSW coast are subject to both natural pressures, such as storms and floods, and development pressures, such as draining, vegetation clearing, increased sediment and nutrient load, dredging and reclamation. In overall terms, much of the estuarine habitat has been altered. This is shown in the following graph, which also includes information on other States. The graph shows that only South Australia has a smaller percentage of its estuaries in a pristine or largely unmodified condition. NSW has the second greatest percentage of its estuaries in an extremely modified condition. This reflects the concentration of urban, industrial and agricultural development along the NSW coastline. This map shows the change in estuarine habitat in the Fullerton Bay area of the Hunter River, in the Hunter-Central Rivers Catchment Management Area. What is clear from this map is that there has been significant and widespread loss of estuarine habitat. Some small and largely isolated areas remain unchanged. What increases have occurred are minor and isolated and so are largely insignificant in terms of the overall estuarine habitat in this area. Changes in habitat type, for example from saltmarsh to mangrove, might not lead to an overall loss of habitat but will have an impact on the types of species present in the area. For example, the following series of photographs show changes in the types of estuarine habitat in Shaws Bay (near Ballina, Northern Rivers Catchment Management area) over time. 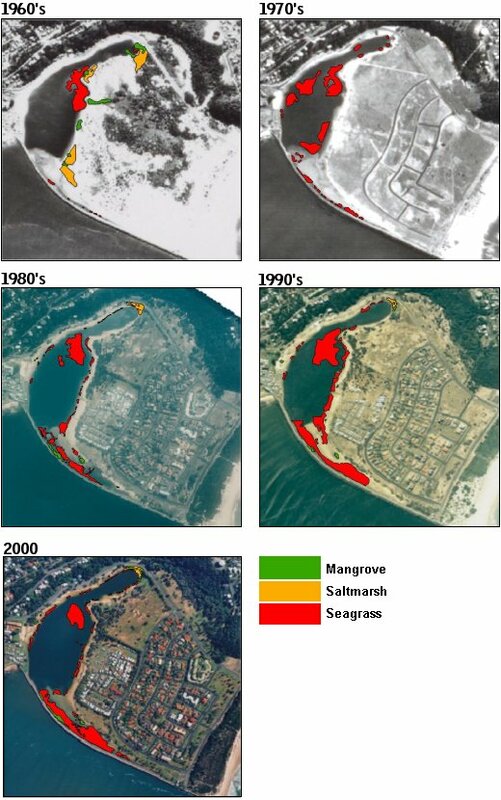 These images show an overall increase in the area of seagrass in Shaws Bay over time. Saltmarsh and mangrove habitats have largely disappeared. One place where change in the distribution of saltmarsh, mangrove and seagrass has been reported is the Parramatta River and Sydney Harbour. It is possible to assess the degree of change as NSW Fisheries mapped the extent of the estuarine vegetation in the early 1980s. Aerial photographs, taken in 2000, and field work produced maps of the current distribution of saltmarsh, mangrove and seagrass. 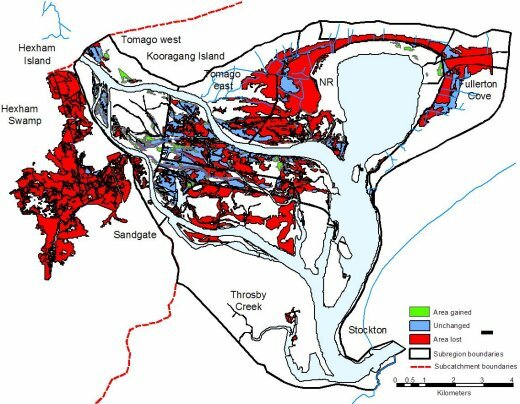 When compared to the maps produced in the 1980s, a large net loss of seagrass from 129 ha to 52 ha was noted, with large losses at some locations (eg Clontarf) and small gains at others (eg Iron Cove). In contrast, the area of mangroves had increased from 148 ha to 185 ha. Area of saltmarsh appeared to have been steady at less than 10 ha. The results show that seagrass has been lost to a large degree and is presumably susceptible to further loss. This situation needs to be examined further due to the importance of seagrass as a fish habitat. The increase in amount of mangrove is also of concern as it confirms studies done elsewhere in the Parramatta River that show an expansion of mangrove that parallels human settlement and use of the river. Most of the wetlands and floodplains in NSW have been significantly affected by human activities over the last 200 years. The table below shows that in several cases the original wetland has been reduced by 90%. In some cases the reduction in wetlands has been caused by lack of water; in other cases by permanent inundation, resulting in changes to the intermittent wetting and drying regimes of wetlands. Table: Changes in NSW wetlands. Source: www2.mdbc.gov.au. Wetlands and floodplains remain one of our most threatened resources. Wetlands have been degraded in a number of ways, reducing their value as fish habitat. The Macquarie Marshes have been reduced in area by at least 40-50%. More than 45% of the area of NSW River Murray wetlands has been degraded by regulated flows and permanent inundation. The Lowbidgee wetlands have been reduced in area by 18%. Along the coast of NSW, 75% of the wetlands have been lost. There are a number of mechanisms involved in wetland and floodplain degradation. Many have been physically drained or modified for the purposes of urban, mining, industrial and rural development. Water extraction for towns, stock and domestic use and irrigation and structures such as dams, weirs, channels, floodgates and levees have changed the natural water regime that sustain wetlands and floodplains and their associated fish populations. The disruption of natural water flow patterns can result in some wetlands becoming completely isolated, while others are permanently inundated. These extremes are not natural and have altered the way wetlands function as fish habitat. Vegetation change can happen because of changed water regime, but is more often due to clearing, grazing and cropping. These practices can result in the loss of native wetland plant species, which can be important food and habitat resources for fish. Cropping and grazing in dry wetland areas can affect tiny organisms that lay dormant during dry times, therefore disrupting what would be an important food supply for fish in wet times. Many farmers have realised the value of native wetland and floodplain plants as drought pasture for stock and are managing their wetlands appropriately. Due to the unnatural flow regimes in many regulated rivers, conditions are suited to the spread of weeds in wetlands and floodplains. The habitat has changed so that local native plant species are no longer adapted to the wetland. Species such as Lippia species, Salvinia species and water hyacinth can dominate wetlands. Salvinia is a declared noxious weed species and thrives in conditions of permanent inundation. It can also live in a wide range of water temperatures. Lippia was introduced from South Africa to be used as lawn. It thrives in the areas adjacent to wetlands and can survive dry and wet conditions. Water hyacinth was introduced from South America and is declared a noxious weed in Australia. It thrives in conditions of permanent inundation and can spread rapidly. Dense growth can reduce fish populations by limiting the quality of fish habitat. Norris R. H., Liston P., Davies N., Dyer F., Linke S., Prosser I. and Young B. (2001) Snapshot of the Murray-Darling Basin River Condition, Report to the Murray-Darling Basin Commission. Norris, R.H., Prosser I., Young B., Liston P., Bauer, N., Davies N., Dyer F., Linke S., and Thoms, M. (2001) The Assessment of River Condition: and audit of the ecological condition of Australian rivers, Final Report submitted to the National Land and Water Resources Audit Office, September 2001. Geoscience Australia, CSIRO and the University of Queensland (2000) National Land and Water Resources Audit.-Estuaries Assessment, Commonwealth of Australia, Canberra. West, G., Williams, R.J. and Laird, R., 2004. Distribution of estuarine vegetation in the Parramatta River and Sydney Harbour, 2000. Final Report to NSW Maritime and the Australian Maritime Safety Authority. NSW Department of Primary Industries - Fisheries Final Report Series No. 70. 37pp. ISSN 1449-9967.